What’s more unique than the amazing mirror maze? A mirror maze, as you’d guess, is maze with walls made from mirror wall panels. This produces a unique effect that obscures potential pathways within the maze, making the experience all the more exciting. Also known as a hall of mirrors, a mirror maze can give participants an experience that they’ll never forget. When inside the mirror maze, participants won’t be able to tell what’s a path and what might be just another mirror wall. Whether used as a scary attraction or a fun novelty, the addition of a mirror maze design attraction to your establishment will be a great one. You’re probably wondering about the cost of mirror maze from those who sell them. In fact, you’re probably wondering where you can even find mirror maze sales online and even offline. The answers to these questions are far simpler than you think. Online, you can find many mirror maze sales companies who offer a variety of options for entertainment centers. Mirror mazes are growing increasingly common among these online sellers, since they’re gaining popularity among people who can’t get enough of amusement attractions. So, searching for a mirror maze design for sale is as simple as starting your search on a search engine. Mirror maze design varies nowadays, too. If you need your mirror maze to be designed in a specific way, you can count on a mirror maze sales company to customize it for you. Some of the most common themes for a mirror maze design include Halloween mazes, dungeon mazes and even a rainforest themed mirror maze. And believe it or not, the presence of a unique mirror maze design can actually help boost your sales in a big way. Imagine hosting a haunted house themed mirror maze during Halloween season—you’ll just watch the profits fly in! Why should you consider buying a mirror maze for sale? Well, that’s simple. Mirror mazes are a unique way to add an amusement attraction to your existing entertainment establishment. You can always purchase the usual type of amusement ride, so why not go for something a little different this time around? AmazingMirrorMaze.com is the web home to the best mirror mazes money can buy. 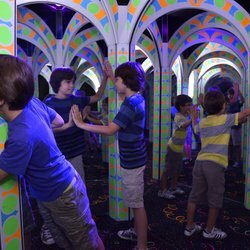 If you’re interested in purchasing one of these unique attractions for your new mirror maze business, visit AmazingMirrorMaze.com today to learn more about our unique selection of mirror maze design attractions.